American Tourister is a brand of luggage owned by Samsonite. Sol Koffler founded American Luggage Works in Providence, Rhode Island, USA in 1933. 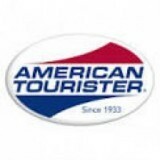 In 1993, American Tourister was acquired by Astrum International, which also owns Samsonite. Astrum was renamed the Samsonite Corporation two years later.